Dr. Trent Douglas and Dr. Katerina Gallus discuss upper and lower eyelid surgery including best candidates, combined procedures, and recovery. Hi, I’m Dr. Trent Douglas with Restore SD Plastic Surgery and I’m joined today by my partner… Dr. Katerina Gallus. To talk to you about blepharoplasty, otherwise known as eyelid lift surgery. The goal of this procedure is to remove eyelid skin from your upper and lower lids, to give a relaxed and refreshed appearance. The best candidates for eyelid surgery have excess skin of the upper eyelids and/or the lower eyelids. The procedure can be performed under local anesthetic or if lower eyelid surgery is being considered, under sedation or general anesthetic. Eyelid surgery is frequently performed in combination with other facial rejuvenation procedures, such as facelift, brow lift, and neck lift. The recovery from eyelid surgery is typically about 14 days. 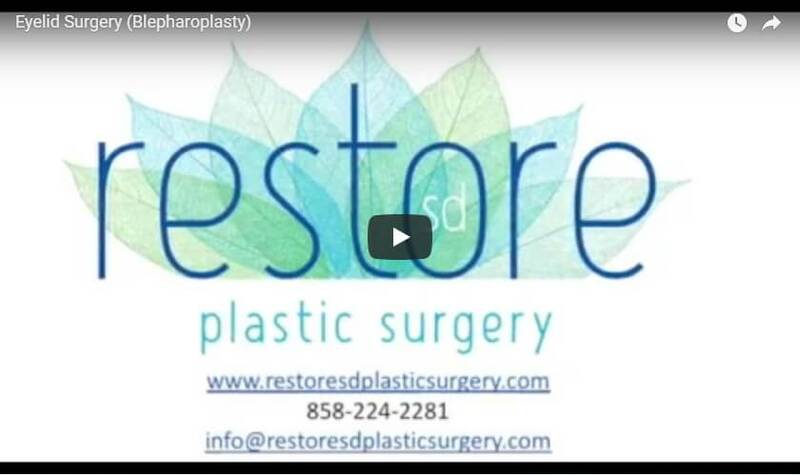 If you are interested in enhancing the appearance of your eyes, please come see us at Restore SD Plastic Surgery.